I have raved about Bernard Malamud’s novels here (well, one of them), but it never occurred to me to try his stories until I was on holiday and picked up a copy of this book in a second-hand bookshop in Kenmare, Co Kerry. Anyone who has been on holiday with an infant will know, in any event, that a book of stories averaging twelve pages apiece is the perfect occupation. 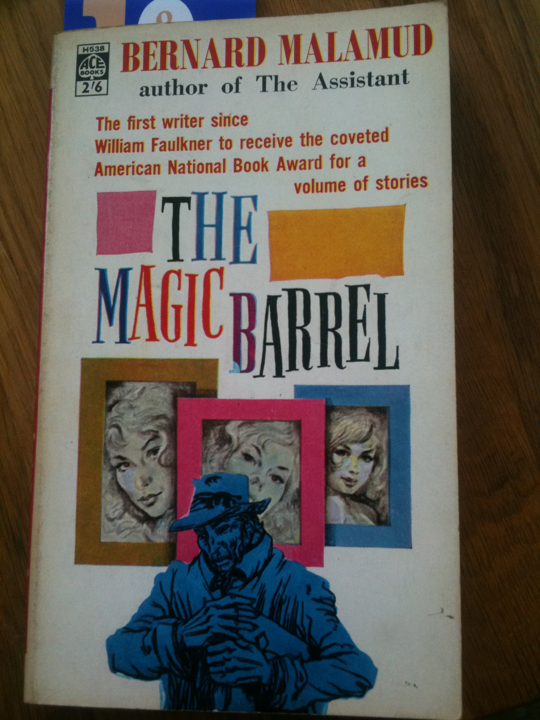 The Magic Barrel (1958) was Malamud’s first collection and contains stories which are, not to muck about, stunning. Together, they create a portrait of Jewish immigrant life in post-war America which, if not quite Dubliners, is coherent and complete. Then he realized that what he called ugly was not Sobel but Miriam’s life if she married him. He felt for his daughter a strange and gripping sorrow, as if she were already Sobel’s bride, the wife, after all, of a shoemaker, and had in her life no more than her mother had had. And all his dreams for her – why he had slaved and destroyed his heart with anxiety and labor – all these dreams of a better life were dead. In ‘Angel Levine’, the small businessman is Manischevitz, a tailor, who has “suffered many reverses and indignities.” Like most of these characters, he is at the end of his rope. When an episode of divine intervention seems to relieve his backache for a few days, he is disappointed when it returns. “He had hoped for a longer interval of easement, long enough to have some thought other than of himself and his troubles.” He resents the pain not just because it is pain but for richer reasons too. Who, after all, was Manischewitz that he had been given so much to suffer? A tailor. Certainly not a man of talent. Upon him suffering was largely wasted. It went nowhere, into nothing: into more suffering. As well as recurring settings – I’m guessing too that Malamud spent time in Italy when young – there is a universal current of desire (or need) in the stories in The Magic Barrel. I remember, years ago, reading Kurt Vonnegut’s guidelines for story writing. The third was “Every character should want something, even if it is only a glass of water.” This seemed to me laughably unsophisticated (though if these were rules by which Vonnegut wrote the stories in Welcome to the Monkey-House, I couldn’t much complain about the results). Well, to prove me wrong again, Malamud makes an art out of making his characters want something. Often this is, or appears to the character to be, selfless, something they want for others rather than themselves: Feld’s wishes for his daughter’s future in ‘The First Seven Years’; Rosen’s urgent desire to help a widow financially in the extraordinary ‘Take Pity’ (one of those stories where the last few lines make you recast everything that has gone before). A couple of times, in ‘Behold the Key’ and ‘The Magic Barrel’, the want runs so deep that Malamud gives us a comedy of multiple attempts to get something right: an apartment, a bride. But his characters are destined not to get things right, though Malamud’s compassionate eye means we feel nothing but sympathy for them. So here is a chance encounter that thrilled me as much as any book this year. Great writing in capsule form, Malamud’s Magic Barrel is a bran tub of delights. Jacobson tick, Malamud tick, Roth tick, cheesecake tick, hypochondria tick, . . . . ok as an accredited representative of the Jewish people I’m authorised to offer you full membership of the Chosen Ones, pending the normal surgical procedures. This is a lovely, lovely book. Malamud is a really marvellous writer. I recently read his ‘The Natural’, a novel ostensibly about baseball, and was gripped. If Malamud can make a committed sports-loather like myself enjoy that, he can do anything. Next up I intend to tackle his ‘God’s Grace’, a satirical post-apocalyptic story. JRSM, oddly, I’ve avoided The Natural as I’d heard it was more or less an apprentice work. I’ve read The Assistant, The Tenants and Dubin’s Lives. I think he wrote only seven novels, didn’t he, so I plan not to speed through them too quickly. As is often the case with the great overlooked, availability of his stuff in the UK is patchy. He used to be in Penguin 20th Century Classics, then Vintage Classics, and a couple of the latter titles (Pictures of Fidelman, Dubin’s Lives) are still available in their Random Collection print-on-demand format (the results are pleasingly floppy, but the cover print quality seems to suffer). I understand however that Vintage are reissuing The Magic Barrel, The Natural and The Tenants in 2012, and I believe Atlantic are reissuing The Fixer (reported by some to be his best novel) around then also. I haven’t read Malamud before but I do have his book The Natural on my TBR list for my American reading list. The Fixer is his masterpiece. It’s about a Jew imprisoned in Tsarist Russia. I must re-read it. By the way, John Self, it’s for me to congratulate you, not the other way around. Sorry, I was just using the phrase (wrongly) as an all-weather sort of Jewish ‘wahay!’ Just shows how much I still have to learn once the pain of the surgeon’s knife has subsided. Mazel means luck, tov is good (this is Hebrew not Yiddish, btw) and is usually used to congratulate someone. Start Worrying. Details to follow. “The Fixer is his masterpiece.” This and ‘A New Life’ are just brilliant. If you’re after some other brilliant mid-century Jewish writing, I can also commend Isaac Bashevis Singer–I just finished his ‘The Magician of Lublin’, about a womanising, mostly-lapsed Jewish travelling stage magician (who is also contemplating a career in burglary) in 1870s Poland, and it is truly wonderful. Interesting that you should mention Singer, JRSM: another of those writers I used to browse in Penguin 20th Century Classics back in the early 90s when I was first exploring the glorious riches of bookshops. I don’t think I ever read him, and only one title (Satan in Goray) sticks in my mind now. I think I mentally had him down as ‘too difficult’, as I did with Bellow. Speaking of mid-century Jewish writing, what about Chaim Potok? Penguin sent me a couple of reissues of The Chosen and My Name is Asher Lev last year, which I greeted with great enthusiasm but haven’t actually got around to opening yet. Nice review; I’ve been meaning to re-read Malamud for a while and this has whet my appetite. He has a tone of voice that would be absolutely unbearable if he had chosen to read any story except for this one. It’s perfectly suited to Malamud’s material. 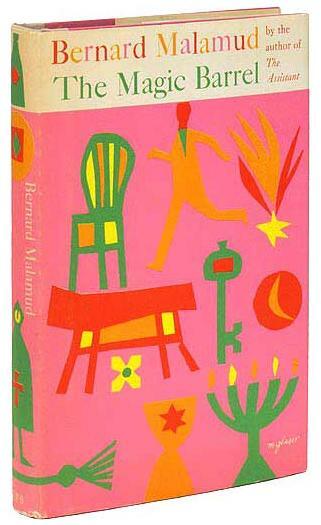 I never read the collections, I went straight to the _Complete Stories_ of Bernard Malamud. And they remain a delight. Well, most of them. At least, I think so, because it must have been at least ten years since I’ve read them. But I got to know them in translation, at least a decade before that. Another Isaac – Babel – deserves a mention. Singer’s novels aren’t great but his stories are not difficult at all once you enter and get used to his world. He is the reason why I will NEVER forgive the Soviet Union, for murdering one of its greatest writers and then lying about it for fear of alienating the post-war French intellectuals like Sartre. Don’t get me started. And let’s complete the set with Joseph Roth. Thanks for the link, Daniel. I look forward to listening to it. I keep meaning to subscribe to that podcast ever since I heard Richard Ford reading Cheever’s ‘Reunion’ (kindly sent to me by Steve Mitchelmore). ”The thousands of cans he had wiped off and packed away, the milk cases dragged in like rocks from the street before dawn in freeze or heat; insults, petty thievery, doling of credit to the impoverished by the poor; the peeling ceiling, flyspecked shelves, puffed cans, dirt, swollen veins, the backbreaking 16-hour day like a heavy hand slapping, upon awakening, the skull, pushing the head down to bend the body’s bones; the hours, the work, the years. And this, presumably, a story that Malamud thought not good enough to go into The Magic Barrel! Lee: oh god, Babel! The original inspiration for all great story writers who don’t cite Chekhov. I picked up the Penguin Classics edition of Red Cavalry and other stories earlier this year (in the LRB shop), but, as ever, have yet to knuckle down. Babel’s a great, great writer and you kind of wonder how you can read quite extensively for years and only come across someone that good by accident. It’s a joke. Everyone should read him. I think the tragedy for Babel was that after they murdered him, his work was out of print for a very long time, including in English. Fascinating piece, Linda. I hope you don’t mind my pasting a particular passage in here. Funny you should mention Joseph Roth, Linda. I picked up The Radetzky March the other day from my shelves (well, piles) and ummed and ahhed a bit trying to decide between it and The Counterlife. Which Roth, which Roth? In the end I plumped for Philip. With only Radetsky March and Life and Fate to go, I’m almost there (although some re-reading would be advisable). I guess it would be hopeless national chauvanism to put a Mordecai Richler title on the list (Duddy?) — perhaps a sub-genre. I have read Duddy Kravitz, Kevin, and only a few years ago. Unfortunately I didn’t think it all that wonderful, and having no blog review to tether my thoughts so, I can’t even remember now why that was. Humboldt’s Gift is the best Bellow book I’ve read. Totally wonderful. Thanks Linda. I’ve got a head start with Metamorphosis and American Pastoral. If it’s any consolation, he only one I’d read at your age was the Kafka. But all of these are works best read in middle age when the terror and disappointment of life has kicked in a bit. By the way, Kafka’s sisters died in Auschwitz, his cousins made it to Tel Aviv. Apparently they made a bad movie out of Angel Levine, which I’m nevertheless curious to see. I nicked that image off Wikipedia, ste. Apparently it’s the first edition cover. You might have a bargain on your hands! Another vote for Babel here, too. He’s good. This sounds like a criticism, but it’s not meant to, but his writing has the plain straightforwardness of good writing for teenagers: lucid, unflashy, but very engaging. We should probably mention Cynthia Ozick (and Linda Grant, of course) just to break the gender monopoly. Both more contemporary, of course. Oh yes, Cynthia Ozick for sure, Kevin! (I omit Linda Grant only because she doesn’t fit the time frame.) It’s perhaps a bit of a stretch to call Ozick more contemporary – yes, she’s still writing, but she’s five years older than Roth, and only a decade or so younger than Bellow and Malamud. Never heard of him in my life, Tony! But thanks for the recommendation, I’m off to look him up. If you’re going to do the full canon of 20th century Jewish novelists then you will have to have S.Y. Agnon, A.B. Yehoshua, Aaron Appelfeld, Imre Kertesz, Yorman Kaniuk, Amos Oz and David Grossman. It pains me that they are all men. Btw John Self, if you haven’t read him already, I suspect you’d like the very short stories of Etgar Keret. Well I have already read some Kertesz and Appelfeld. But I started reading ‘How it was Done in Odessa’ earlier this evening and gave up on page 2, completely baffled as to what was happening and who they were talking about. That’s particularly shaming given that, at 10 pages, it’s one of the longest stories in the whole book. How often have I told you not to eat bacon with bagels, now you can’t understand Isaac Babel. Herman Broch’s The Sleepwalkers is cited by many to be a masterpiece – anyone read that? I’m a great Malamud fan especially The Assistant and A New Life. The latter has the most wonderful description of what’s it’s like to be in love in a new relationship. I loved Bellow’s The Dean’s December a wintry book which reflected a sad and wintry period in my life but on the whole I find Bellow clever but unappealingly sexist ( and Roth too for that matter ) . Malamud for me is far warmer and sympathetic. Chaim Potok in my opinion is a far inferior writer though his descriptions of life in the NY Hassidic community are interesting. Lee – I picked up The Sleepwalkers in the UCL library in London once, having read an interesting description of it but glancing through it made me put it down again as it looked thuddingly boring and enormously long and I speak as someone who reads fast and is not usually intimidated by enormous novels. I’ll put in a vote for the ‘Sleepwalkers’ trilogy, though I’ve only read the first 2 books, which I really enjoyed. The second book especially, about a man who works as a promoter for female wrestlers in 1910s Berlin, is really good. How about an Anglo-Jewish writer? Alexander Baron is rather excellent, and ‘The Lowlife’ (a Jewish gambler in 1960s Hackney) and ‘From the City, From the Plough’ (an English infantry regiment finds its fate in Normandy) are both newly reissued and quietly fantastic. Both books left me stunned, frankly. He is particularly good with drawing realistic characters, and making you care about them. I don’t know why he is so forgotten; he really should be on a big (Penguin, Vintage) Classics list. Thanks for the recommendation, Jonathan. I haven’t heard of Baron but I see that The Lowlife was one of Harvill’s short-lived London Writing series just before it got swallowed up into the Random House behemoth. The newly reissued edition from Black Spring Press is significantly less handsome. But a lot cheaper! Thanks again for the suggestion. Another vote for Alexander Baron here, too. ‘The Lowlife’, ‘From the City, From the Plough’, ‘There’s No Home’ (a second WW2 novel) and ‘The In-Between Time’ are all excellent. ‘Strip Jack Naked’, a sequel to ‘The Lowlife’, is a little disappointing, given the first book’s greatness. Great blog by the way, John. And give Baron a try. Another of the London Writing titles is also good (actually, all four are, but this one is relevant to the Jewish theme here): Fowler’s End by Gerald Kersh. It is very, very funny. Sam Yudenow is glorious. It’s been google booked, if you fancy a quick on-line taster. I was going to complain here that John had added another writer to my ever growing pile of people to read. Then I read this thread. Ouch. The Magician of Lublin sounds just up my street. I’ve printed off Linda Grant’s list of which I’ve only read one (Hotel Savoy is a very accessible first Joseph Roth by the way and I’ve blogged one of his essay collections, a wonderful writer). I also have When I Lived in Modern Times on the bookshelf, which I’m rather looking forward to. It has one of the most bizarre reviews I’ve seen on Amazon, where someone rates it according to 20 factors (though lists 21 in fact) including whether it made him feel better about humanity. Amazon reviewers, they can at times be a special breed (and I say that having written a couple myself, back when I was younger and more foolish).